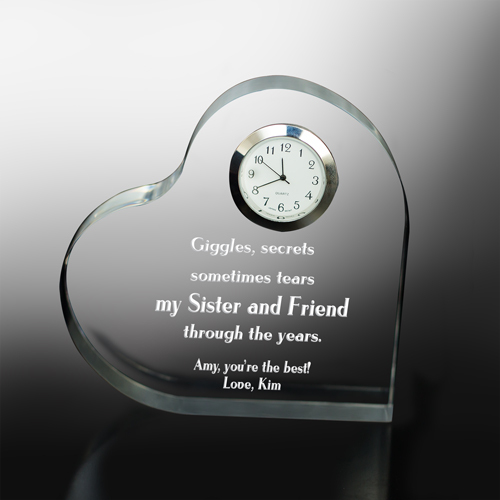 You're sister's love is something you treasure, let her know by presenting her with this Engraved Keepsake Heart Clock. Our elegantly clear Engraved Personalized Keepsake measures 5"x5" with edges measuring 3/4" thick featuring a silver edged timepiece with quartz movement. Includes FREE Personalization! Personalize your Engraved Keepsake Heart Clock with any two line message. Made of heavy, solid acrylic. I purchased this as a last minute Christmas gift for someone I consider my sister and she loved it. It looks better in person as well. I was very pleased with it and would recommend this to anyone. GiftsForYouNow.com offers many unique personalized keepsakes for your friends. Some of our most popular Friendship gifts are our Personalized Friendship Frames, Friendship shirts & of course our Personalized Friendship Keepsakes. We also carry an extensive line of Personalized Sister gifts. Show your Sister how much you love her with our Personalized Sister shirts & Sister Keepsakes! Shop GiftsForYouNow.com for all your Sister Gifts & Friendship Gifts!